"I often improvise in my YouTube Videos, that’s the nature of boogie woogie. The problem is that it’s difficult to slow down riffs and solos to the exact speed learners require. We play the riffs slow, but sometimes not slow enough!" "Even with the easy bits, it would be nice to have the sheet music in front of you." I’ve spent a ton of money on all kinds of blues and boogie tutorial books. Most of them were pretty average and didn’t really improve my playing. Dr K’s user-friendly material, however, has literally skyrocketed my boogie playing to the next level! The Badass Boogie Bundle Pdf is unquestionably the best boogie purchase I have ever made! After spending just an hour with the Bundles I knew I had got more than my money’s worth. Heck, in the past I’ve often paid double the price of the Boogie Bundles just for some a--hole to sit beside me and show me how to play Yankee friggin’ Doodle for 30 minutes! The material presented in the Badass Boogie Bundles is absolutely priceless if you are a boogie woogie student or enthusiast. I bought the both the Badass Boogie Bundles when they first came out and I can honestly say that there is a lifetime of learning distilled in these pages. The sheet music, history, culture, listening skills, performance techniques, how to practise, how to improvise boogie…everything! I am still totally blown away by the depth of material contained in the Bundles. 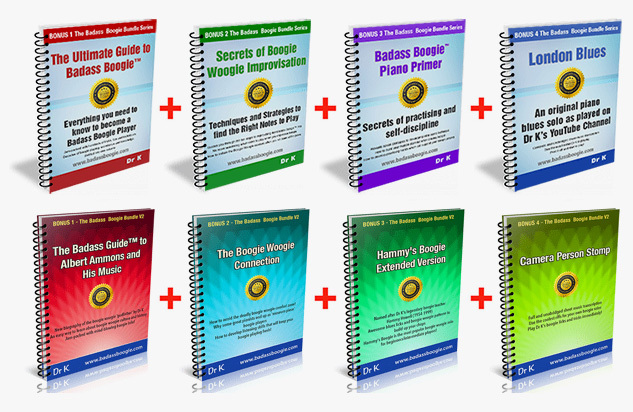 That's 60 of Dr K's most popular boogie woogie YouTube lessons. All transcribed in easy-to-read, sheet music form. Jam-packed with hundreds of tricks, tips and techniques. Decades of boogie playing, experience and knowledge, distilled into one volume. This bonus alone is worth the price of the download. Guides you through the ten steps to improvising like Badass Boogie™ Pro. No more wondering what notes to play when you improvise boogie. Reveals seven strategies to developing killer piano technique. How to build your muscle stamina when playing boogie. How to develop practising habits which will support your boogie playing. Print it off and start to play! Jam-packed with mind-blowing boogie info! How to avoid the deadly boogie woogie comfort zone! How to develop listening skills that will keep your boogie playing fresh! Hammy's Boogie is the most popular boogie woogie solo for beginners/intermediate players! Play Dr K’s boogie licks and tricks immediately! What happens when I pay for the Badass Boogie Bundle with my credit card? 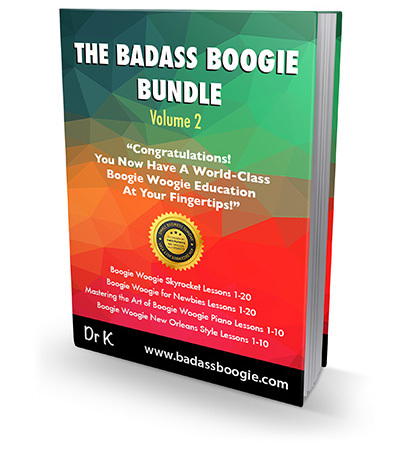 You will automatically be emailed a link to the Badass Boogie Bundle PDF Download. When you click on the link you can download the PDF file to your computer and/or print it off immediately. What happens if for some reason I don't get a link? Check your junk/spam box first, as Hotmail and Yahoo are often oversensitive in classifying automatic emails as spam. I've checked my emails and my junk box and there's no link/my computer's blown up/got stolen/got a virus/I've deleted the link by mistake/my iPad is playing up/the zip file's gone missing/my mobile phone got thrown out of the window...etc Help! No problem! Just email DR K directly at brenkav@hotmail.com and he will email you the Badass Boogie Bundle personally, usually within 24 hours. 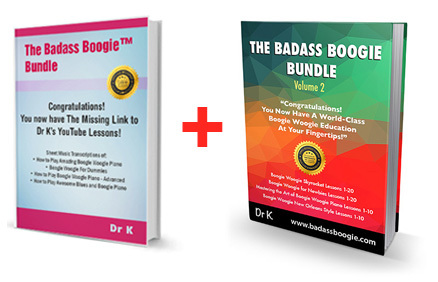 What is the difference between the original Badass Boogie Bundle and the Badass Boogie Bundle Vol 2? They are two totally different products. 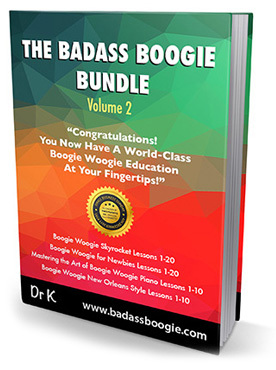 The Badass Boogie Bundle Vol 2 contains 60 brand new boogie woogie sheet music transcriptions (not contained in the original Badass Boogie Bundle) as well as other exciting boogie bonuses! Each Bundle stands on its own as a world-class boogie woogie learning system, but together…..they’re dynamite! Do I need the Badass Boogie Bundle Vol 2 if I already own the original Badass Boogie Bundle? If you wish to continue your boogie woogie education, the simple answer is YES. Do the transcriptions in the Bundle contain Dr K’s boogie woogie improvisations in the lessons, or just the lessons? The best way to answer this question is to print out the FREE sample of the transcriptions on this page and compare them with the relevant YouTube lessons. You’ll see that the transcriptions contain EVERYTHING.